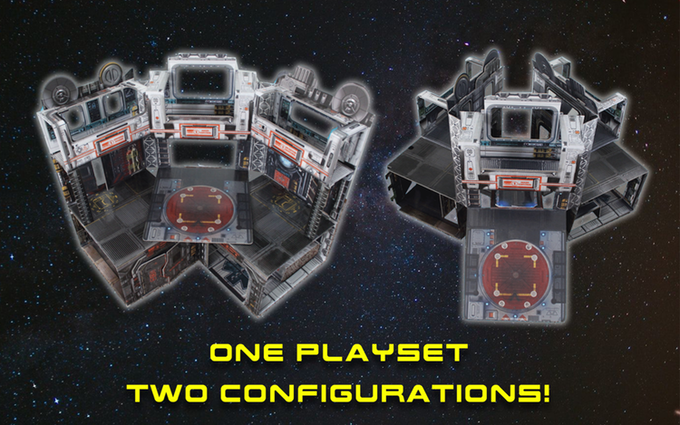 HissTank › Compatible Military Toys › Space Base Playset by Readysetz Kickstarter is Live! 3-D foldable playset that requires no assembly, easily folds and unfolds for play or storage, has photorealistic graphics and more! At last, Space Base is here! THIS EXCITING PLAYSET requires no assembly, folds and unfolds for play or storage in seconds, has photorealistic graphics and multiple levels of play! Check out the Kickstarter for more information! Readysetz just went live with the Space Base Playset Kickstarter. Got my pledge in. Can't wait to get this playset in hand. I pledged for the Small playset for my Joes, AWoK and my son's Star Wars, but I'm reading that the scale might be a little off. Would I be better served with the Large playset for 3 3/4" figures too? I pledged for the large set, which I foresee will be overrun with (NECA) Aliens and Predators. Hopefully they will post pics with figures for size comparison. There is a picture at the bottom of the page where a 3.75 X Wing is on the large landing pad. After reading some of the comments I changed my pledge to the larger set. I am also curious as to what the Urban 2.0 set looks like. Huh? There's no international shipping option? What is this, 1995? well who wants to go through the trouble of shipping to Wisconsin? If anyone has the current Urban set and the Urban 18 set can you post some pictures with Joes? I am especially interested how they look around the doors and window heights. All times are GMT -4. The time now is 2:15 PM.